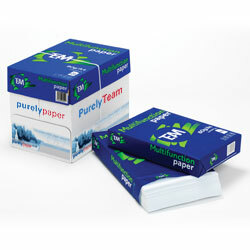 A reliable and consistent general purpose white copier and laser paper for high volume printing and copying. Ideal for volume copies, faxes, drafts. PurelyTeam Multifunction is guaranteed for use on all mono laser and inkjet printers, copiers and fax machines, offering reliable and trouble-free volume copier and laser printing for a variety of applications. Economy paper with quality consistency. Wood fibre from sustainable forest. ECF Low Chlorine. ISO 14001.